The 50 plasmid cpFRET biosensor toolkit can be used to generate and optimize genetically encoded, unimolecular FRET sensors for ratiometric measurements by a simple and quick process. A Versatile Toolkit to Produce Sensitive FRET Biosensors to Visualize Signaling in Time and Space. Fritz RD, Letzelter M, Reimann A, Martin K, Fusco L, Ritsma L, Ponsioen B, Fluri E, Schulte-Merker S, van Rheenen J and Pertz O. Science Signaling 2013, Jul 23;6(285):rs12. doi: 10.1126/scisignal.2004135 PubMed PMID 23882122. The circular permutation-based fluorescence resonance energy transfer (cpFRET) biosensor toolkit is a vector library for the generation and/or optimization of genetically encoded, unimolecular FRET sensors for ratiometric measurements. This toolkit aims to simplify and accelerate biosensor production and is intended for a broad community interested in spatio-temporal analysis of signal transduction processes. The hallmark of the cpFRET kit is the variation of parameters influencing FRET efficiency: distance between fluorophores is modified by linkers of different lengths, whereas dipole orientation of fluorophores is manipulated through circular permutations introduced in both the mTFP1 donor and the Venus acceptor fluorophores. Additionally, different sensing module topologies can be used to further enhance the geometrical variety. This also enables accommodating signaling molecules that require a native N- or C-terminus for lipid modification. This pTriEx-based library consists of two designs containing 25 biosensors each. The pTriEx vector system allows for biosensor expression in E. coli, insect and vertebrate cells. Within one design, the wild type (wt) mTFP1 fluorophore and its four circular permutations are each combined with the wild type Venus fluorophore and its four circular permutations. Design 1 biosensors are built according to a fluorophore-outside configuration: mTFP1 (wt and cp variants) are followed by a proline-directed WW phospho-binding domain, a 72 amino acid (aa) glycine linker, a 10 aa ERK substrate peptide from Cdc25C, a four aa ERK docking site, Venus (wt and cp variants) and a nuclear export signal (Figure 1A). 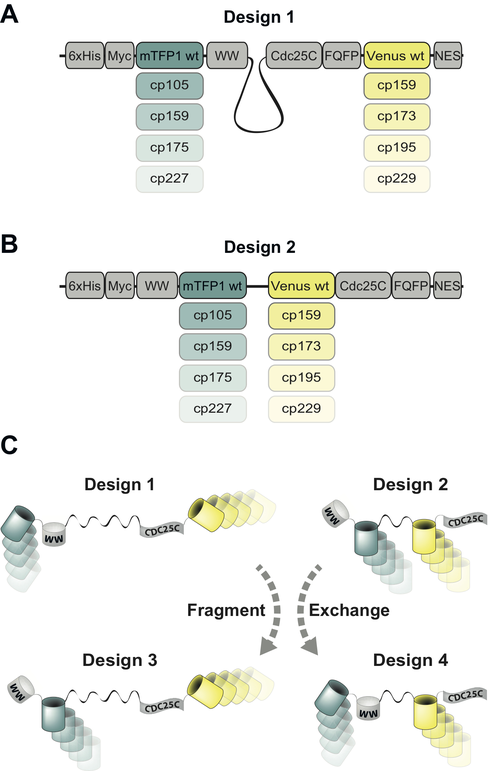 Design 2 sensors are built according to a fluorophore-inside architecture: The WW domain is followed by mTFP1 (wt and cp variants), a 20 aa linker, Venus (wt and cp variants), the Cdc25C substrate peptide, the ERK docking site and the nuclear export signal (Figure 1B). Two additional designs can be generated by simple domain swapping yielding designs 3 and 4, which display a mixed architecture with fluorophores alternating with sensing module components (Figure 1C). In order to produce new biosensors or optimize already existing ones, the WW domain and the ERK substrate/ERK docking peptides can be exchanged by new sensing modules of choice. The nuclear export signal may be removed to construct nuclear reporters. Moreover, the fluorophores can be substituted as well, to take advantage of new donor/acceptor combinations. The cloning procedure is streamlined due to unique restriction sites flanking all components in the biosensor module. Having produced a new library with the sensing modules of interest, one can screen the entire library using an assay exhibiting robust biosensor ON and OFF states, in order to identify the sensor(s) with the highest dynamic range and the most desirable spectral properties. Figure 1. Overview of biosensor designs 1 (A) and designs 2 (B) and cloning strategy to generate additional designs 3 and 4 (C). Note, that the His and Myc tags as well as the ERK docking sequence (Phe-Qln-Phe-Pro) and the nuclear export signal (NES) are not shown in (C) for the sake of clarity. Detailed description of the cpFRET toolkit and practical notes for cloning can be found in the original publication. "The plasmid kit used for generating biosensors was a gift from Olivier Pertz (Addgene kit # 1000000021)"